Where is the name of the Penguindrum derived from? What does the symbolic life energy of a person have to with the penguins, or moreover with drums? I understand the significance of the penguins, but that seems to be wholly separated from the concept. According to Good Haro, the person who helped make the fansubs for PD, the kanji for ringo (apple) can be read as pingu in Chinese. So it's a pun of sorts, because the pingudrum is an apple. I think that the drum symbolizes a beating heart. damn it now i feel stupid. As a disclaimer, I have just watched this for the first time, so a rewatch is certainly in order to reassess my views and for me to spot things I may have not picked up on the first round. But being as familiar as I am with Utena, I sort of felt like I was prepared to read into things the way Ikuhara sort of demands the viewer to when going into this show. I don't know if this has been posted anywhere, but I wanted to state my opinion on the significance of the "drum" component of penguindrum. It didn't really dawn on me until about midway through the series, and after following along to the opening lyrics a couple of times that I caught onto this, but indeed, I really honed in on the last line of the second opening: "まわりはじめるディステニー" "Mawari hajimeru Destiny" or "The Turning Wheel of Destiny" as I translated it in my head. The way it is said in Japanese struck me as profoundly religious (Buddhist)! Remember, it is not just the Penguindrum...but the ROTATING Penguindrum. The first thing that was immediately conjured up in my mind was that the Penguindrum was possibly Shiva's drum. As he beats on the drum, he simultaneously destroys and creates existence. It has also been said that Shiva's drum matches the rhythm of a beating heart. According to Hindu mythology, Shiva is the lord of the cosmic dance and the cosmic sound of AUM, from which the entire universe in generated. Shiva is often depicted with an "hourglass drum" or damaru, which provides the music for the dance, and symbolizes the act of the creation of the universe through sound. The sounding of Shiva's drum produced the first sound (Nada, the source of creation) in the void of nothingness; its pulse setting up a rhythm to which Shiva began his dance of creation. Also, I later got a sense that the Penguindrum is quite possibly also the dharmachakra. 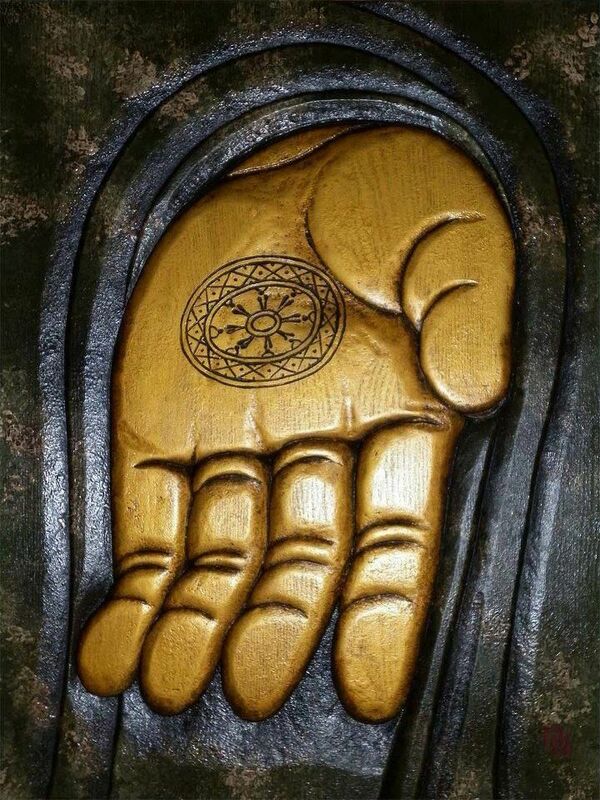 It is quite common to see Buddhist statues with engravings of a dharmachakra symbol engraved onto palms. It certainly brings new meaning to the phrase "ピングドラムを手に入れるのだ" which I've seen translated as "find/obtain the penguin drum", but is literally "place it in your hands". Also, the title of the show is written as 輪る in kanji. This is very different than how mawaru is usually written (回る/廻る/周る). You do, however, find this kanji in the Japanese word for the dharmachakra (法輪). It is also the same kanji for "wa" in "少年少女輪になって" (shounen shoujo wa ni natte). The fact that this is in both the opening and closing of the song lyrics makes me think it is what could be called a "epanaleptic polyptoton" or "traductio" in English. This rhetorical device further emphasizes the cyclical nature of karma as a theme of the show. Honestly, the part that didn't make since to me was the need to define it as the "Penguin" drum. The penguins seemed incredibly random to me, and I thought perhaps they were added to be cute or were just a red herring. I also thought it was odd it was called the Pingudoramu rather than the Pengindoramu (pengin being the Japanese pronunciation of Penguin.) I just double checked http://www.yellowbridge.com/chinese/dic … cterMode=s and confirmed HonorableShadow's remark about it being the Chinese pronunciation of Ringo/apple. This is enlightening!!! So it could be seen as Ringo's Wheel of Destiny! I really want to sit down and analyze the significance of the diary cover. The only thing of note I saw was what appeared to be the Rod of Asclepius. I have not come up with any sort of meaning for the temple or turtle though. It certainly has a marine theme, and we see Ringo underwater in several scenes. (As well as giant serpents!?! -- Are they the serpents on the cover!?!) I'll have to rewatch and report back. Sorry, I couldn't stop thinking about it after the second opening...it really needs to be a song for a Penguindrum AMV.